Lubricates – Reduces friction to lower pulling tension and pulling stress on wire/cable. Zero Mess – Dries quickly and leaves zero mess at end of receiving side of the pull, unlike traditional wax and gel pulling lubricants. Atomizable Liquid – Can be sprayed from pressurized sprayer or hand trigger sprayer. Wipe Application – Can be wiped onto small cables with a saturated cloth. Compatible with Most Cable Jackets* – Suitable for use on a broad variey of thermoplastic and thermoset cable jackets. ULC Listed – Listed product when needed for NEC and CEC installations. * Contact American Polywater for specific recommendations on LSZH/LSHF or CSPE cable jacket types. Polywater® SPY™ Lubricant is a concentrated liquid that can be sprayed into the duct or wiped on the cable in a thin film. Industrial sprayers are available for automatic spraying application. Polywater® SPY™is based on unique lubricant chemistry and technology. Much like a paint, the lubricant thins as it is sprayed or wiped. Once on the cable or conduit surface, it thickens to stay coated. Polywater® SPY™ Sprayable Cable Pulling Lubricant reduces friction effectively and compares favorably with the other high-quality Polywater® Lubricants. — Lubricating fiberglass rods for easier and longer insertions during fishing. — Spraying holes in wood studs to reduce tension in hand-pulled Romex wire. — Eliminating need to fish by allowing shorter runs of wire to be pushed. — Lowering tension on traditional building wire pulling into EMT or PVC conduits. — Pressurized spraying for no-mess underground cable installation. Polywater® SPY™ comes in two grades - a regular grade and a winter grade for cold weather use in temperatures as low as -20°F/-30°C. The SPY-35LR is a refillable, spray trigger bottle practical for shorter wire runs. 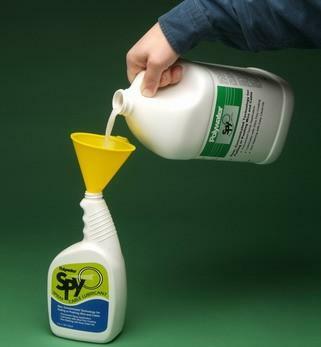 The bulk packages of Polywater® SPY™ can be applied from a pressure sprayer (see demonstration video on right sidebar). The SPY-D20 contains lubricant-saturated towels that coat the wires as they are pulled.